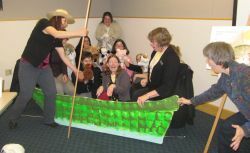 Anyone interested in the association's activities or in Oregon libraries is welcome to join OLA. Find out about the membership dues, by scrolling down to the bottom of this page, and the benefits of becoming an OLA member. These business memberships include all OLA benefits and rights of membership. Use the form for Personal Membership Form and select "Business/Commerical Partner - Sustaining" under Membership Type. OLA/ALA Joint Student Membership - Join OLA and ALA for one low rate. Institutional Membership - Full institutional members ($150 membership) may have up to seven affiliate members as part of their subscription. These memberships are for Friends of the Library, trustees, or other non- library personnel and include all OLA benefits and rights of membership. Use the form for Personal Membership and select "Institution - Sustaining" under Membership Type. Already a member and you want to join an OLA unit? Add an Affiliation/Publication Form - Only use this form if you are already a member and want to join an OLA unit, such as ACRL-OR, Public Library Division, Legal Reference Round Table. Feel free to contact a unit's chair for more information about becoming more involved. This form can also be used to request a print version of "The Interchange," Oregon Association of School Libraries Newsletter. Scholarship Donation Form (under construction) - Your contributions to the OLA Scholarship program helps members pursue educational and leadership opportunities.